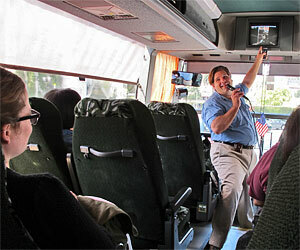 Tour guide providers that operate in areas of Los Angeles other than Hollywood Boulevard. Location: West Hollywood + Pickup. Half-day tour, all-day tour, private charters. Pickup in Anaheim and nearby. 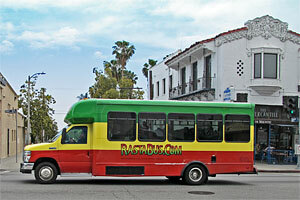 Off the beaten path historic bus/walking tours exploring L.A. along offbeat themes, or following the lives of personalities in Los Angeles history. This tour company walks the city and rides the Metro to authentically experience L.A. Their tours are designed to enable tourists to immerse themselves in the culture, history and beauty of L.A. Several of them also include opportunities to eat some of our fabulous Southern Californian food. 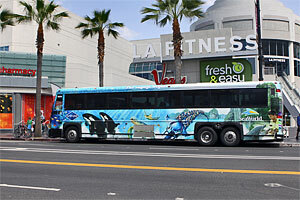 This company also provides a citywide walking/Metro tour, as well as tours for LAX layovers. Motorcycle tours that originate in Pasadena and range in length of time from a few hours to a few days. 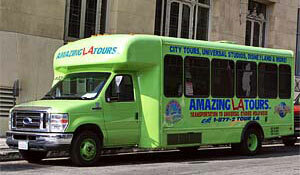 Day-long tours of the city, beaches and local mountains. Motorcycle rentals available. 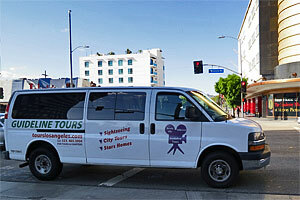 Pickup only: Farmers Market/The Grove and Downtown L.A.
Tours of Los Angeles and Hollywood. CPUC PERMIT STATUS: These tour providers were licensed with the California Public Utilities Commission (CPUC) when added to this list. Permit numbers are included for all applicable firms. You can use the CPUC Online Lookup to verify the permit is still either active or pending (also verify that their name is correctly listed). Enter only the numeric part of the CPUC registration, without designation or trailing letters. For example, to look up "TCP# 12345-A" you would enter "12345"